Isn’t it nice to have access to things that are easy? We are grateful that people create and share with such generosity. Something we can write on our gratitude lists! That’s what we went searching for- banners that are instant to print up, they are free, and they bring a powerful thought to our holiday gathering. Just reading them brings something good to our hearts! We’re all for that! This fun banner is from Shanty 2 Chic. They provide each letter as a pdf from their site. Just go here and you’ll find everything you need to make this! Thank you Shanty 2 chic!!! We ARE grateful to Kristi from i should be mopping the floor (Heaven forbid) for sharing this fun FREE printable with us. She makes the download very easy from her site. You can find it here. This one is also from Kristi. We’re telling you, you are going to want to bookmark her blog because she has lots of FREE (notice how we always capitalize that word?) printables on her top bar. WOW!! Thanks Kristi. Go here at i should be mopping the floor to find this one, and do a little exploring on her site while you’re there. We’ve shared things from Paper Trail Design in earlier Thanksgiving posts. Here’s another one. They are generous folk, aren’t they? You can find this banner with glittery looking letters here. How great is this? You get to create your own Thanksgiving banner with the pdf for all these letters. Very clever indeed 6 clever sisters! 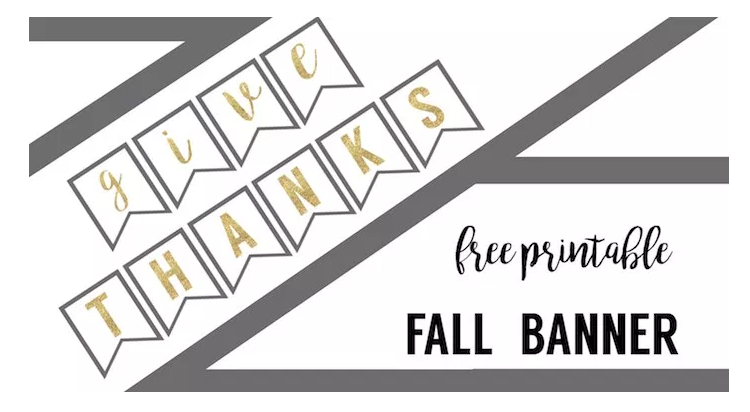 They give you 3 options - the Thankful banner - a Happy Fall banner - AND - all the letters to make your own. Each has their own download button that goes directly to a pdf to print. Yahoo!! Love it when it’s easy like that. You can find access to all 3 here. We hope this has been helpful to you and we wish you a Happy Thanksgiving! We’ve really got you covered for Thanksgiving! For all our Thanksgiving posts go here, here, here, here, here and here. We have been working to simplify your Thanksgiving and make it shine! !